Lately, I've have noticed how hard many of us are working. We represent our companies with professionalism and they get their money's worth out of us. We organize our families and get the kids where they need to be. Now, how about us? Life is flying by. Some of us live in too much stress and too little fun. Our kids are growing older by the minute ... so ... let's make October the month we celebrate the good life. Here are some amazing opportunities coming up in the next few weeks. 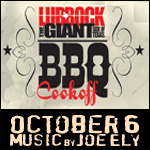 The Lubbock Fun Club will be there or we are partners in promoting these following events! JOIN US! See below for a closer look at activities this week and next. SEE MAGIC on the face of YOUR CHILD. Through October 1, 2005 - South Plains Fair! October 2 - Desert Reign – Free Country Gospel 6:00 p.m.
For information on these and many other events, visit our CALENDAR OF EVENTS and look up the event by DATE. For details, contact the event directly. Events are subject to change. WANT TICKETS to a Tech Game? Play "Mall Ball" at South Plains Mall. Visit Calendar of Events for details on these and many more! Details for these and MANY more upcoming events, click here to see!